Does anyone know what the differences between one handed swords, maces, and axes are? From what I have seen Axes have the highest base damage and fastest swings. Swords have same base damage as axes but are slower and Maces have lower base damage with faster swings. The Mace and Axe pictured below are comparable in Rarity and item level yet the Axe has a clear advantage DPS wise. 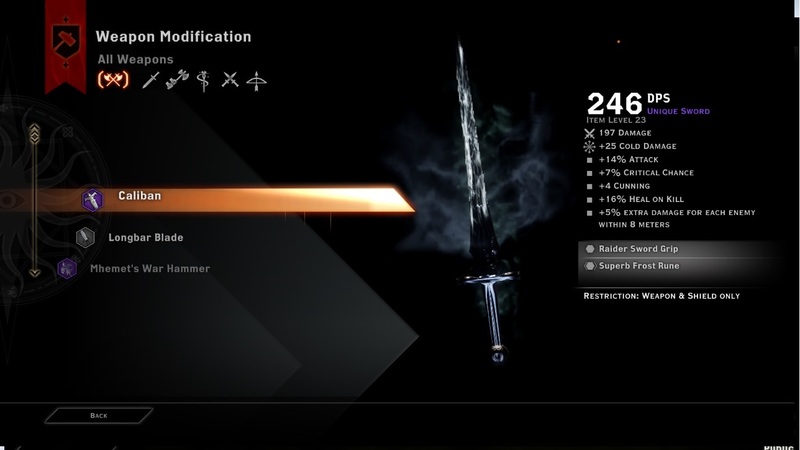 The sword is unique and lvl 23 but still has lower DPS then the pictured Axe. There has to be advantages to the lower dps of Mace and Sword right? Higher DPS means that when you are swinging you will deal more damage over time. From those 3 above the First Tournament Axe will deal the most damage this way. +20 str on the item means +10% damage. This doesn't stack as far as I know with other bonuses but it's additive (so actual dps gain will be lower). Also the mace is a level lower so comparison between the two is hard. The sword on the other hand has the highest base (or on hit) damage. This is good for two things - first armor is a flat damage reduction (1 point of armor negates 1 damage), therefore higher base damage means the weapon will perform better against high armor targets (for example against 100 armor the axe will have 112 dps, but the sword will have 121). The second - and more important aspect to consider - is ability damage. These are based on weapon damage - which is highest on the sword. So if you swing a lot and rarely use abilities (for example on a lego) that deal damage all else being equal pick the highest DPS. If you use abilities exclusively (like a reaver or in case the sword a templar) pick the one with the highest base damage. I regret not posting better weapons to compare. 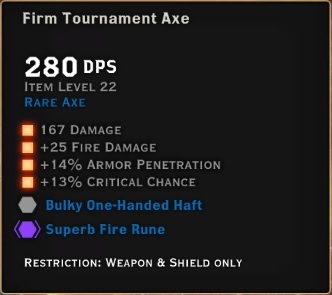 As you can see this weapon is the same rarity and level of the Axe but with 3 base damage higher and 64 dps lower. The 3 damage difference can be due to regular item variance (yes the same items can have minor differences), I'm positive that axes and swords share the same benchmark base damages. also there is no way a single level would justify a weapon having 46 less base damage as with the mace to axe example. I use the axe on my tanks and the dps is 285 with 170 base. 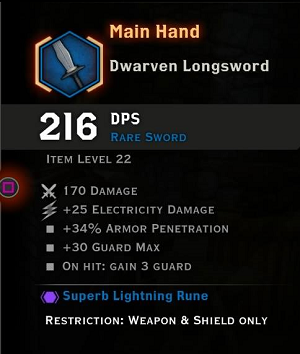 I would love to use that mace but there is no way I would use it with such a large difference in both base damage and dps when compared to my axe. none of the discussions I have seen about the different weapon types talk about how they handle utility/offense slots differently when crafting. in fact, the base damage for every type of weapon is the same. they vary by the specific schematic used. working with a long bearded axe, for offensive slots, i get offered crit chance, armor pen, and sunder of varying % depending on materials. 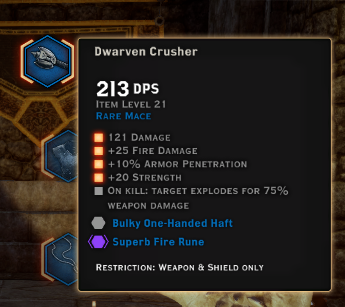 working with a kirkwall mace, for offensive slots I also get offered pure attack %, something the axe did not. utility slots vary the same. so, you CAN actually make maces that at the same level will outdamage axes/swords per swing simply because you can boost the attack % on them. it really depends more on the schematic you are using, even at the same level, than anything else, but different types of weapons will give different bonuses to slots.